Stay productive on the go—Create, convert, organize, and sign PDFs in the office or from your mobile device. And easily edit PDFs on an iPad. 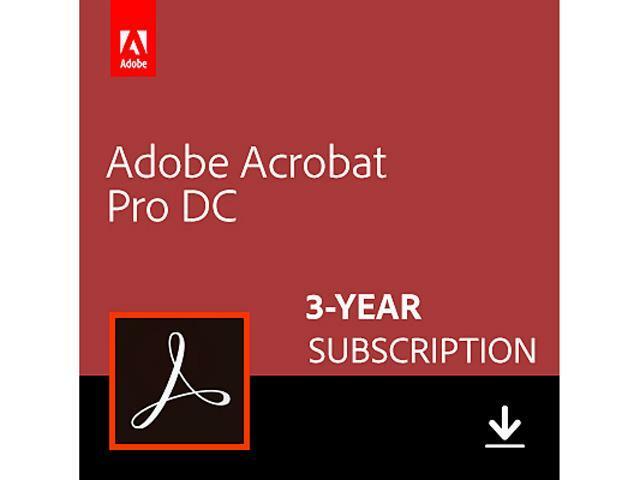 Adobe Acrobat Pro DC brings stunning simplicity to everyday PDF tasks-including revolutionary enhancements for editing PDFs and scanned documents-while the included Adobe Document Cloud services let you accomplish more-in the office or on the go. From Adobe, the leader in secure digital documents for over 20 years. NEW Scan paper to PDFs you can edit instantly with fonts that match the original. NEW Edit PDFs faster with full-page paragraph reflow and easy bullet updates. IMPROVED Export PDFs to Microsoft Word, Excel, or PowerPoint with improved bullet and table formatting. NEW Fix suspected text recognition errors in scans faster with a side-by-side view. NEW Fill, sign, and send forms fast from anywhere with smart autofill. NEW Access, edit, and store files in your Dropbox, Box, and Microsoft OneDrive accounts. NEW Access and share files from your computer or mobile device. NEW Automatically fix document photos to remove backgrounds and adjust perspective. NEW Use a spell checker to identify and fix typos in your PDF. NEW Save on ink and toner on your Windows PC. NEW Create PDFs from Microsoft Word on Mac, with links intact. NEW Get a simpler user experience that works easily with touch-enabled devices.